Timothy Elpadaro Thedford, better known by his fans as Jay Electronica, is an American rapper born on September 19, 1976. He originates from from the Magnolia Projects in New Orleans, Louisiana. He produced the first track, "Queens Get the Money", on the 2008 Nas album 'Untitled'. The unconventional nature of much of his music, and the lack of conventional release methods for that music, has since 2007 made him the object of much attention. He was perhaps best known for the piece of music Act 1: Eternal Sunshine (The Pledge), until the release of the Just Blaze-produced track "Exhibit C" in late 2009. Announced Friday, November 12, 2010, Jay is an official member of Jay-Z's Roc Nation. 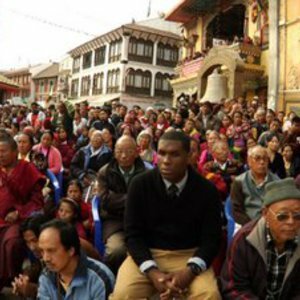 Jay Electronica has yet to release a full-length album but has released two official singles to date, "Exhibit A" and "Exhibit C," which won a Sucker Free Summit Award for Instant Classic. His music so far has been made available through the internet, either through being leaked to what URB magazine describes as "obscure web forums", or through an appearing and disappearing MySpace page (currently two seem to be in existence, at /jayelect and at /jayelectronica). Erykah Badu has questioned whether he ever will release, in her words, "actual albums". from New Orleans, LA he has lived in Baltimore, Philadelphia, Washington, D.C., Denver, and Detroit, where he recorded his Style Wars-era music with several J Dilla beats, meeting the producer subsequently to ask for permission to use the recordings as a demo. Detroit is where Electronica met producer/engineer Mike "Chav" Chavarria, who introduced him to both J Dilla and Mr. Porter, and who is now a regular collaborator. Jay Electronica first gained significant attention through Act 1: Eternal Sunshine (The Pledge), made available on a MySpace page in 2007. It is 9:13 continuous minutes of music, without drums, built from Jon Brion's soundtrack to the film Eternal Sunshine of the Spotless Mind. There are five segments or movements, marked by changes in music and mood, raps by Electronica, and occasional snippets of sampled dialogue (children arguing in Kurdish, Gene Wilder as Willy Wonka). The first segment is spoken word by Just Blaze and Erykah Badu describing the artist over piano music. The nature of the piece of music, along with the nature of its appearance, led to a slow build-up of interest in Electronica as an enigmatic figure. Songs circulating online as the Style Wars EP gained wider circulation, and other songs, such as the dream-inspired "Dimethyltryptamine", soon appeared. In January 2008, Gilles Peterson's 90-minute Gilles Peterson Worldwide was devoted to the rapper. Hiphopdx.com in 2008 called him "arguably...the most talked about new emcee last year ... at times...more like a myth or urban legend than an actual rapper", and URB ran a cover story on the artist under the banner "Jay Electronica: A Spotless Mind:: An MC's mystery revealed", which referred to his wanderings as his being "like some sort of hip-hop Jack Kerouac". Jeff Weiss' piece for the L.A. Weekly, "Jay Electronica: Much Better Than His Name Would Suggest", acknowledged that the rapper could be fairly described as "one of the most buzzed about rappers of 2008", but attempted to temper the hype somewhat, describing Act 1... as "ambitious, wildly original, if not slightly pretentious", while endorsing only to an extent the comparisons URB had made (referencing an "abstract rhyming style") to rappers like Nas and Pharoahe Monch. According to URB, Act II: Patents of Nobility will feature Nas, and will be the second of a putative trilogy. URB also reported that digital EPs with both Guilty Simpson and producer 9th Wonder were planned. His most recent music as of November 2008 is the Just Blaze-produced track "Exhibit A (Transformations)". According to a Filter TV interview, Jay Electronica has partnered with Decon to release his debut project. It is being described as a multi-media release and footage from the project which was partially shot in Nepal and Dubai has begun to surface online. The first clip to leak is titled "Dear Moleskine" and can be found on YouTube, the track was produced by Just Blaze and the clip was directed by Jason Goldwatch from Decon. In June of 2009, Decon and Jay's "The Dogon Society" released "Exhibit A" digitally. "Exhibit C" was released on iTunes December 16, 2009 and quickly shot to the top 10 of the iTunes Hip-Hop charts. The following week it was chosen by Hot 97's DJ Enuff as the Heavy Hitter pick of the week. On February 9, 2010, it was announced Jay Electronica will appear at the 2010 Bonnaroo Music Festival. Further proof of the continuing buzz about this artist saw On Jay Electronica sell out 2 nights at the Jazz Cafe Jazz Caf?, London (UK) on Feb 17, 2010. Jay Electronica continued his scattered release practice, dropping "A Million In The Morning" on April 4, 2010. The song features a weary Electronica trying to keep himself awake to escape his nightmares. On April 30th, Jay Electronica debuted "The Ghost of Christopher Wallace" via his Twitter. The song features P Diddy and is produced by London beatsmith Quincey Tones, who is known for producing such acts as Young Jeezy and Royce da 5'9". On 12th November 2010, Jay-Z announced that Jay Electronica was officially the newest member of his own 'Roc Nation' record label/management company, which boasts such acts as J. Cole and Willow Smith. Jay has been travelling the world and was in London, United Kingdom for an extended period of time completing his debut album 'Act II: Patents of Nobility (The Turn)'. Jay Electronica and Erykah Badu have a child together, a girl named Mars Merkaba, born on February 1, 2009.